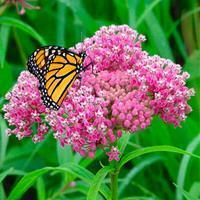 This summer blooming perennial can be planted in early spring or fall. Attractive to hummingbirds, bees, and butterflies but not deer, bee balm is an excellent addition to naturalized borders as well as old-fashioned cottage gardens. It will grow best in a soil that is rich and moist yet well-drained in full sun, or part sun in drier, hotter locations, where it might appreciate some light afternoon shade. Add a couple of inches of mulch for weed control and moisture retention. Cut back after flowering to promote bushier plants. Bee balm can spread quickly underground via rhizomes, which are horizontal underground stems that put out shoots and roots. Divide in spring every few years or when the center begins to die out. Watering Details: Keep moist, especially in full sun, but do not let it get soggy. Soil pH: Prefers acidic to neutral, but will grow in slightly alkaline soils. Adding some well-rotted manure to alkaline soil can help to bring the pH level down a bit. Fertilizer: Each spring, scratch in about 1/2-1" of compost. Diseases & Pests: Bee balm is susceptible to mildew, but Jacob Cline is somewhat resistant. If in doubt, mildew can be prevented by thinning and allowing for good air circulation. Keeping soil evenly moist will also help to prevent this problem. Plant: Shrub-like with ovate, bright green leaves. Flowering: Red flowers made up of many tubules present a botanical fireworks show. Seeds: The flower will turn into an interesting brown ball with many tubules containing tiny brown seeds. Self-sows. The genus Monarda was created in honor of a Spanish physician and botanist named Nicolas Bautista Monardes (1493-1588). Despite his never having travelled to the Americas, he was able to study American medicinal plants in Spain due to Spanish control over New World trade.